Bubble Bobble Lost Cave | 100 forgotten levels. For the first time on the original Bubble Bobble coin-op. 100 forgotten levels. For the first time on the original Bubble Bobble coin-op. SOURCE: NES RND 29 I hope you’re enjoying this NES streak! This is another easy to remember port-only round, and it often proves to be trickier than expected. Blame the fast flowing bubbles, or the nasty way those Zen-chans behave, getting struck here and there and requiring some carefully balanced jumps. The huge Zen-chan shaped platorm layout proves to be more than a lazy way to fill the room. It’s challenging, and it works very nice inside Lost Cave too. It’s quite obvious that everyone at Taito was satisfied with this one, and that’s why you can find it also on Game Boy (RND29 too) and on Sega Master System (RND101). Check them out. SOURCE: NES RND A04 (RND104) You may remember that to see the real ending on the NES you had to deal with the crystal ball AND the door. A nearly impossible task in my childhood, actually. Relax, in Lost Cave you’ll be able to see all the NES extra levels without so much pain. Here’s RND 104, for example. Super relaxing, similar to the famous “BONUS” ARC RND 45, a great chance to get the 64000 bubble combo, hardly dangerous by any means. This level is sponsored by Y.K., that is, Yuichiro Kawamuki as you can discover by finishing the NES game. He was one of the programmers of the NES port. You know, the coin-op development team did it with their levels, the initials thing and all. So even the creators of the home port wanted their share of eternal fame! I easily recreated the tile graphics from the NES version, just adding some variations on the borders, taking advantage of the rarely used bright green palette pattern from the coin-op. One last thing: can you spot the difference between the Lost Cave edit and the NES edit? Sure you can. That 2×2 block on the NES is actually a fake one – you fall thru it. It would have been really complex to simulate it on the arcade engine, which lacks this feature originally. Well, it was of course feasible with some Aladar magic, but we thought it was not a very stylish feature, after all. What you see is what you get. And you get a custom rendition of the original NES graphic tiles. SOURCE: Game Boy Round 27 Game Boy developers’ creative laziness at work again! See, the enemy placement is almost identical to the one you can find in ARC RND 26. Compare with the screenshot here. They just changed the whole geometry of the room et voilà, a totally new level is here! Because of that, when creating Lost Cave I left exactly the same coin-op round statistics for this level. Which is quite a stupid thing to do, because it plays completely different, of course! I left the flame bubbles appear ratio ON too, which is even more stupid since there are no floor/ceiling entrances in this one. Oh well. The results? 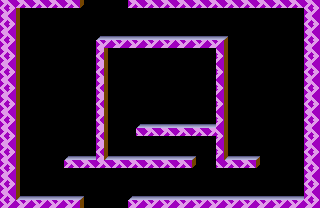 A quite hard level, in my opinion, which must be faced with some tactics in mind (ie find safe spots standing on vertical bars, bubble the enemies, pop them as fast as you can). SOURCE: Game Boy Color RND 9-JNG The ninth round of the Game Boy Color Jungle Branch is blatant rip-off of RND 28 (or J-1) on the “Pyramid Land” branch of Bubble Symphony, titled “SILK HAT”. Branches, rip-offs, name changes… Who cares? The important thing is that the level plays quite good now, with a good rhythm given by faster than average bubbles and aggressive Monstas. I changed the airflows in order to let the skilled players gather all the enemies inside the box – then it’s just a matter of good timing and the sweet 32000 combo is at hand. And it’s not over! Being this level numbered as a multiple of 5, you get a special bonus when every enemy is knocked out. This time it’s a little computer, again an exclusive from the Sega Master System port. Is it maybe a Sega SC-3000 home computer? Or maybe a NEC 8801? Or my beloved MSX? SOURCE: Game Boy Round 24 Ah, here’s another one well remembered by noth NES and GB Bubble Bobble players; in both cases, as well as in Lost Cave, it’s round 24. A easy to remember giant Pulpul, where the true challenge is to climb a ladder of bubbles (it’s safer on the right) to get rid of those Pulpuls who get stuck in the upper part of the room. Since Pulpuls behave in a unique way on the coin-op, to reproduce the “get stuck” part was not easy without moving them around a bit, and switching their starting direction too. The best layout to do it was the Game Boy one. The NES (below, left) was not very elegant, while the Master System take on this level (below, right) was dull: the holes on the floor/ceiling made it too easy to reach the top of the Pulpul! I went for the warm palette of the SMS, tho’. SOURCE: Game Boy Color RND 13-FRS You may think this is the satanic twist in Lost Cave, but we found out that the upside down cross is a highly revered symbol for Christians. Looks like St. Peter (hence the name “petrine”) asked to be crucified on a reversed cross because hey, to die like Jesus is too much. Talk about being humile! Not that the GBC Japanese developers cared for this stuff. It really feels like they were on a tight deadline -can you spot the symmetry mistake in their level? Luckily, once ported to Lost Cave, it plays nicely. A good challenge, which needs some pattern planning to avoid dying. If I start a match from a clean machine boot, I often get the potion as a special item in this screen (or in the former ones) .